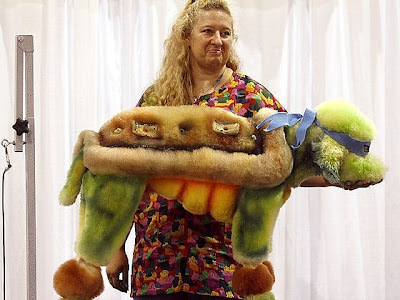 So you__re thinking something like: __What is that lady doing with an odd-looking oversized Ninja Turtle cuddly toy?_ Except that it isn__t a cuddly toy. 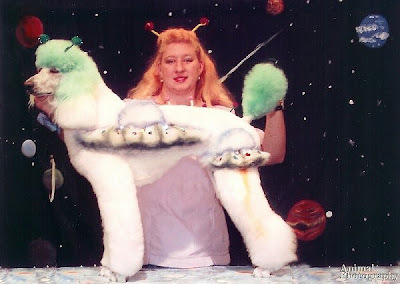 It__s a real live poodle. Meet Cindy, also known as Leonardoodle, and her owner, Sandy Paws. 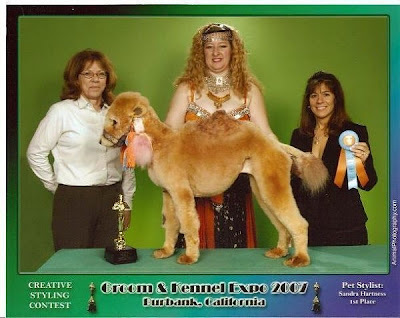 The picture before you is just one of Ms Paws__ executions of __creative grooming_. We__re really not sure if it__s ethical, but here are some more jaw-dropping examples of Sandy__s canine-sprucing makeovers on Cindy. 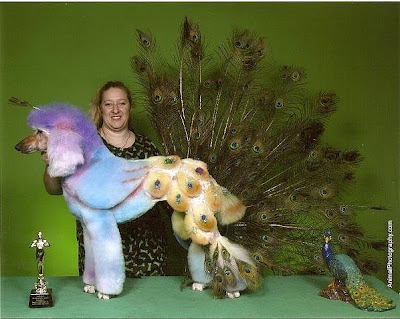 People might claim that someone who does this sort of thing to dogs has got some answering to do. One dog-lover even wondered how she would like it if she were forced to have an all over body tattoo made up of stuff in dogs__ imaginations __ bones, say, or rubber balls. A hair-brained remark if ever there was one __ you see, Cindy has lots of guises, none of them permanent __ though you can see what the guy was getting at. In any case, clearly the judges don__t see things the same way as the critics. 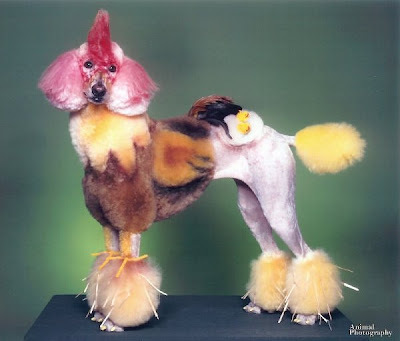 Yes, folks, this is creative grooming at it__s finest; award winning creative grooming. It seems Sandy and Cindy have been scooping prizes everywhere from Burbank in the duo__s native California, to Las Vegas, Nevada, and you can__t fault the skill of Sandy__s handiwork __ or its, erm, imagination. 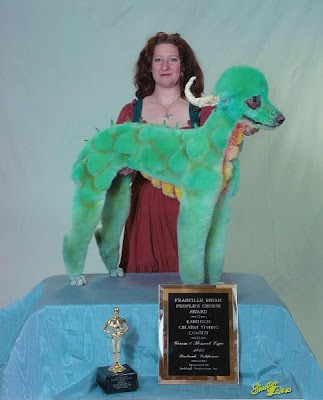 Who would ever think of transforming a dog into a camel __ or a dragon? 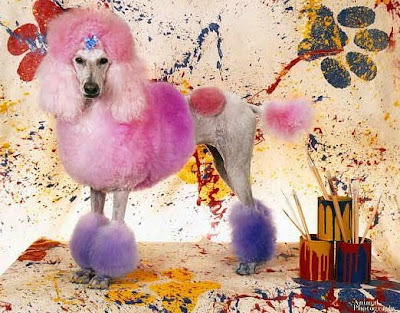 In Sandy Paws__ defence, she claims to use only semi-permanent hair colour, blo-pens, coloured artists__ chalk with a smidgen of hairspray, temporary spray colour __ what else? __ oh yes, and all the __special touches_ __ add-ons such as feathers, pompoms and plastic flowers. A veritable arsenal of colourants, props and adhesives, then, though apparently nothing Sandy wouldn__t use on herself. That__s OK then. One other point made by those who see grooming in general as an important part of dog care is that it helps to build a relationship between the dog and owner. Well, judging from the photos, Sandy is certainly enjoying the bonding sessions. But is it us, or does Cindy look as though she__s not quite so pleased to be there? For those who are left a little queasy by the whole concept __ if not by the garish colours then by its syrupy beauty queen sheen __ the good news is that there__s a whole sub-culture out there. 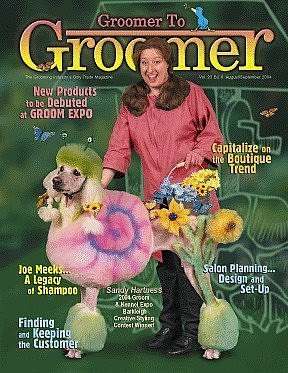 25 years young and with a readership of 20,000, magazine Groomer to Groomer is a mouthpiece for all things groom-tastic. Scary? Needless to say, Sandy and Cindy have made the front cover. Galeri Topi Topi Cewek yang UNIK UNIK euy !! !